Vortox Air Technology Marine Air Cleaners are designed to keep engines clean and free of debris in moist environments such as boats and ships where continuous exposure to dust is not a concern. The Marine Air Cleaner filters out debris from the shoreline and deck, protects the engine from anything that could be potentially consumed, and acts as a silencer by reducing engine noise. Vortox Air Technology Marine filter elements are filled with a wire media that is made from either Monel or T304 Stainless Steel coiled wire. This filter will not rust and is completely washable. 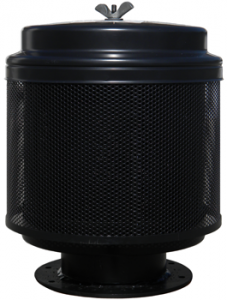 All Vortox Air Technology Marine Air Cleaners are built with durable Electro Galvanized Carbon Steel and finished with a baked polyester coating.